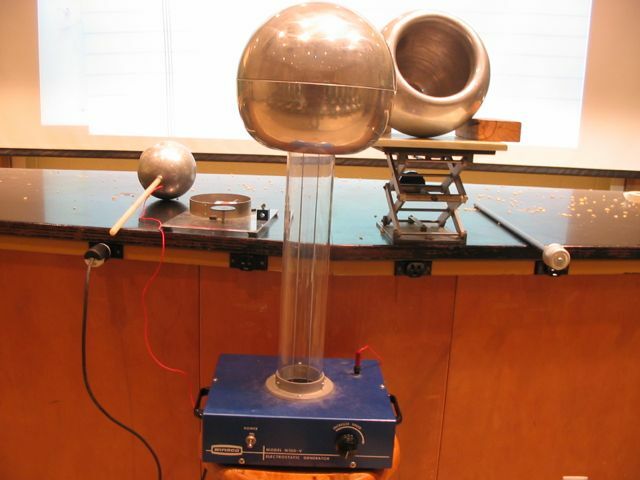 Description: Wooden stand for standing on when using the Van de Graff generator. 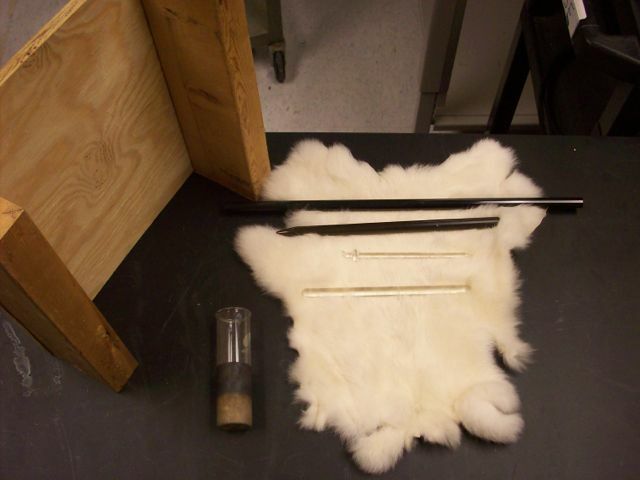 Rabbit fur, plastic rods, and glass rods for generating/storing charge. 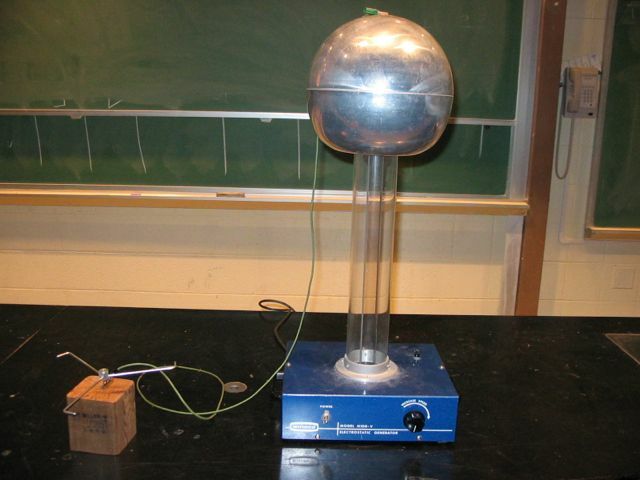 Description: Useful for several electrostatic demonstrations. 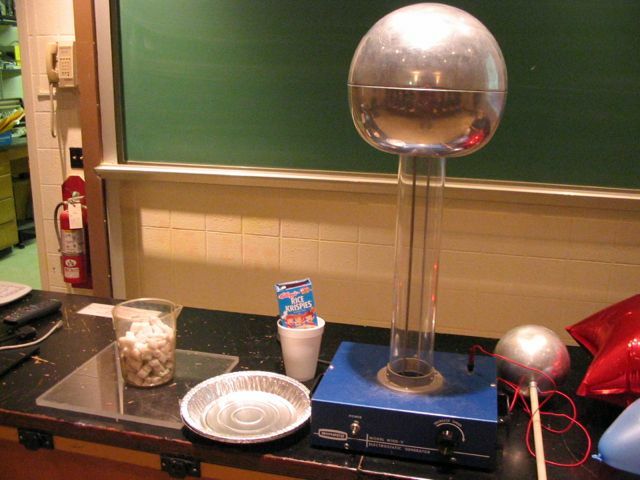 Rice crispies or Styrofoam peanuts placed on the dome will scatter from the electrostatic repulsion. 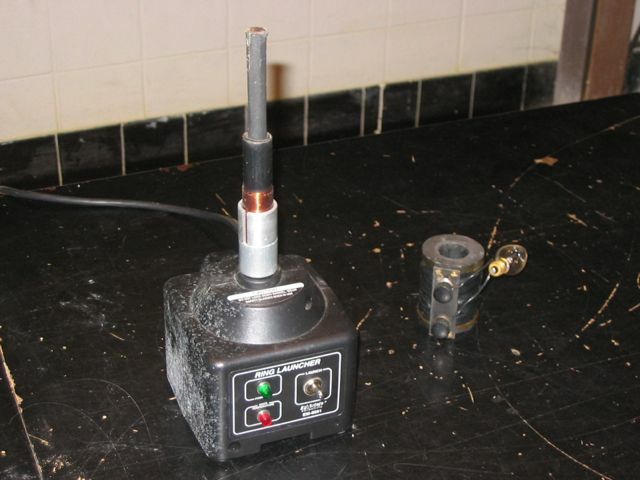 Large sparks can be made with the discharge wand. A florescent light bulb tube will illuminate if brought near the dome. 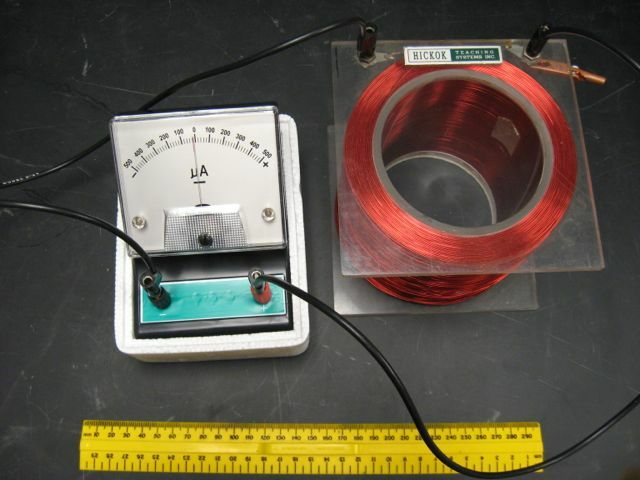 Description: Demonstration of electrostatic shielding inside of a conductor. 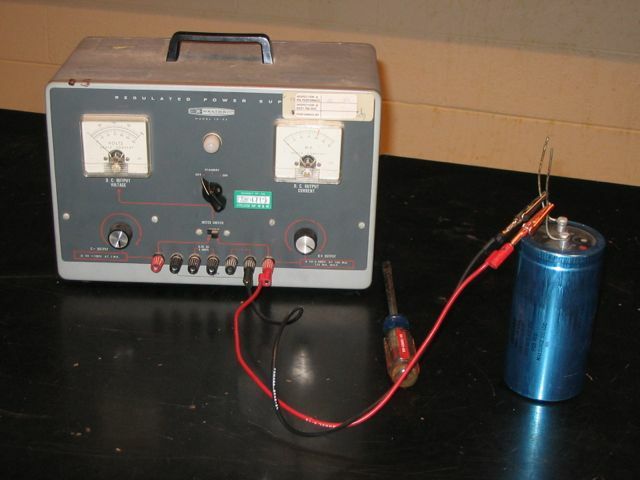 Description: Discharge of a large capacitor. Typically discharged with the large (3 ft) screwdriver. Note: This capacitor stores significant energy and is dangerous. Replace aligator clips and shorting wire between the terminals when finished. Description: Iron filings are suspended in a fluid. 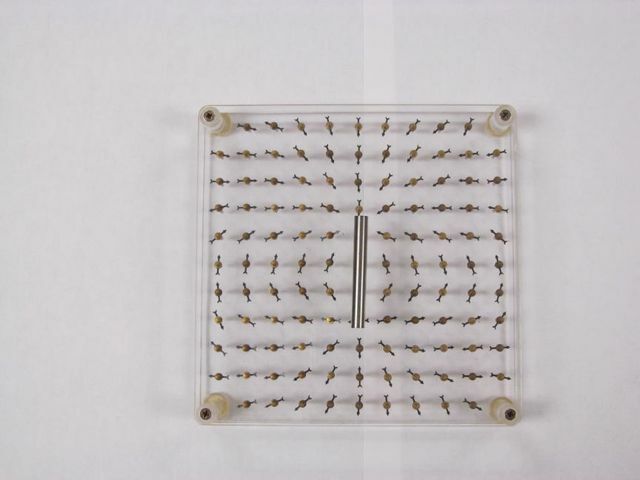 When a bar magnet is placed in the hole through the center of the cube, the magnetic field lines become visible. 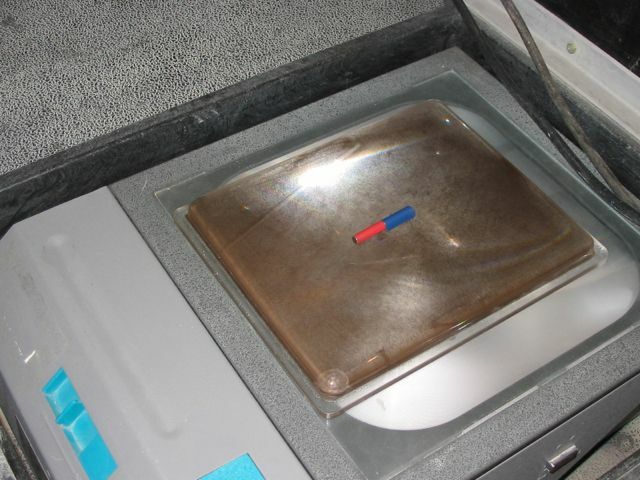 There is also a flat version of which works well on an overhead projector. Far left picture illustrates sheets of magnetic material that allow the visualization of field lines. 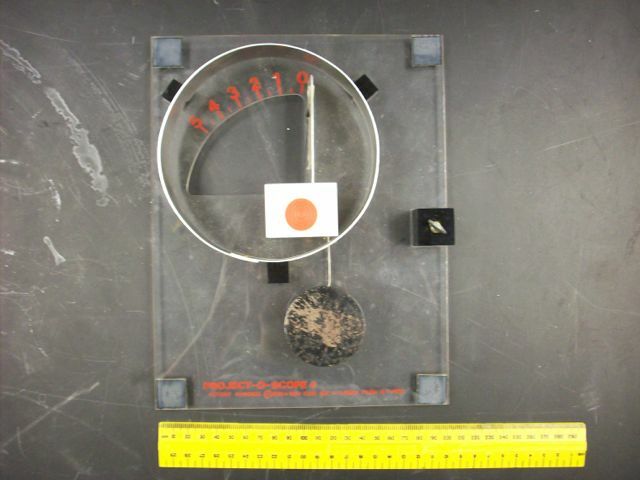 Description: Sprinkle iron filings on the plexiglass. Run current through the wires and the filings will align with the solenoid's field lines. Description: A large current is briefly passed through the wire which is located between the poles of a strong permanent magnet. The current switch is a telegraph 'tap' switch. 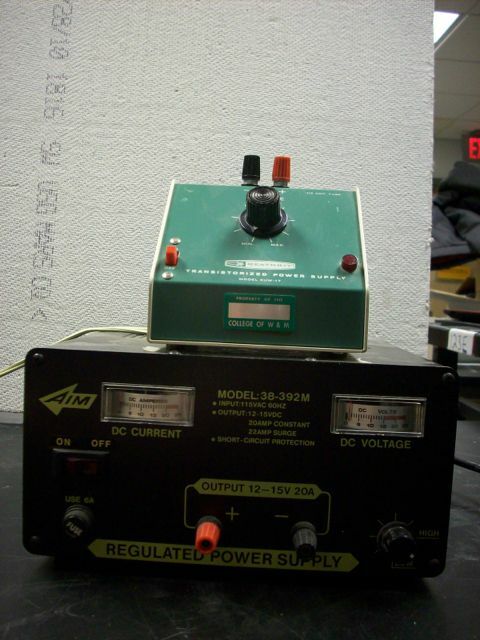 The current is supplied by a car battery which needs to be charged before use. Description: An insulator, metal ring and metal ring with an small slit through it are swung through the strong magnetic field of a permanent magnet. 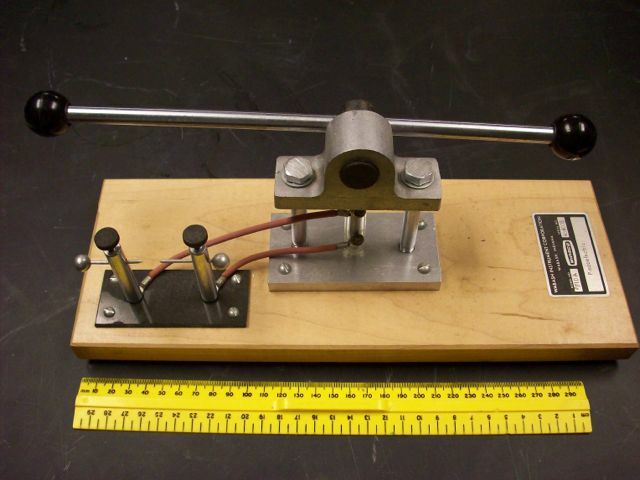 Eddy currents in the metal ring noticeably change the motion through the magnetic field. 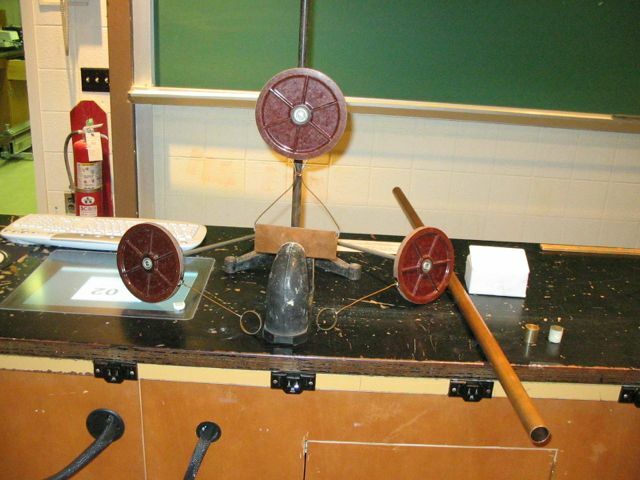 Description: A strong permanent magnet is dropped through a long copper tube. 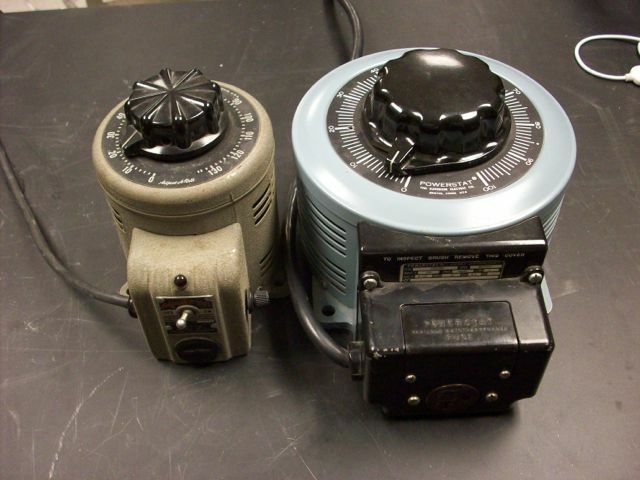 Eddy currents cause the magnet to fall slowly. 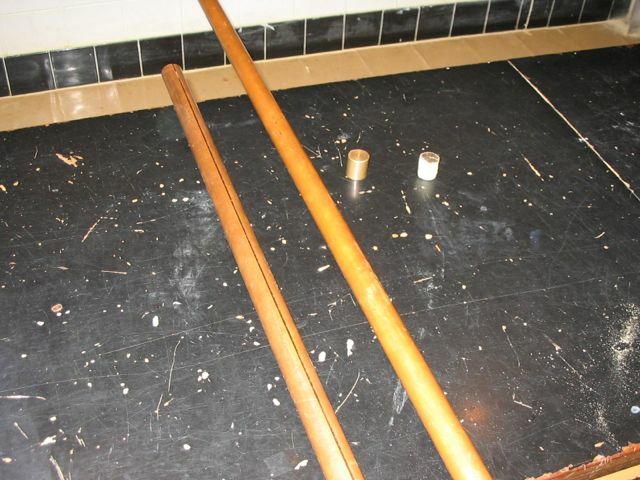 A copper cylinder dropped through falls quickley. Either dropped through the tube with a slit in it fall at the same speed. 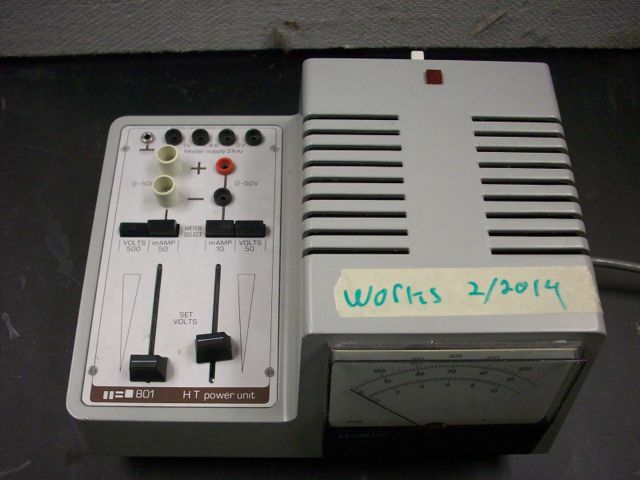 Description: AC power is applied to a coil in the base of the unit. 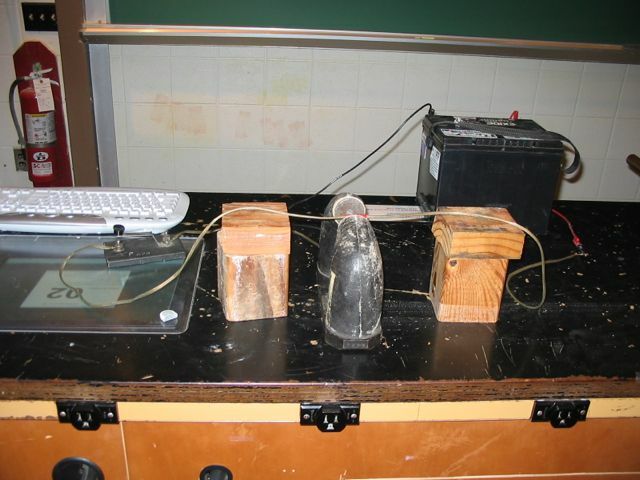 A removable secondary coil with a bulb lights up when the current is applied. An aluminum loop will launch from the base because of the induced current in the loop. A split loop will not move. 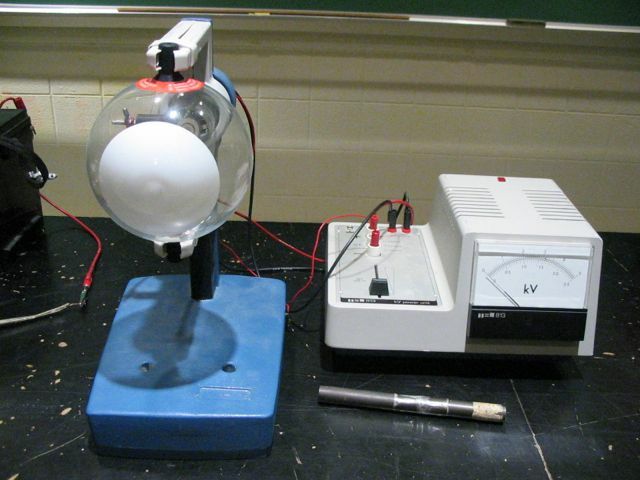 Description: Use a magnet to deflect the electron beam in the tube. 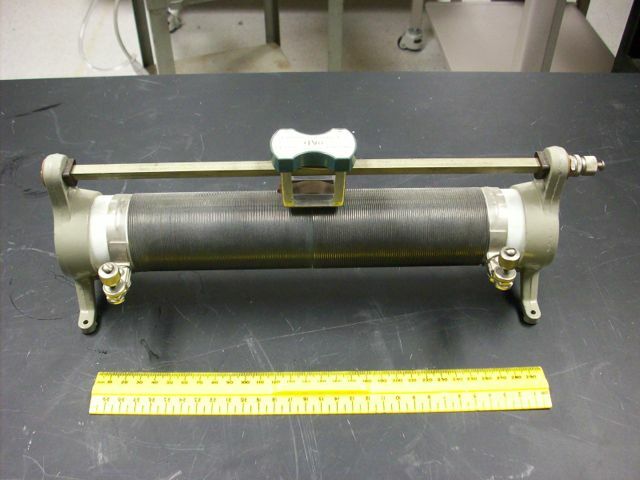 The electron beam is visible on the florescence coating on the inside of the front of the tube. Description: Grasp the handles and flex the rod side to side. Sparks will appear between the two adjustable spikes. 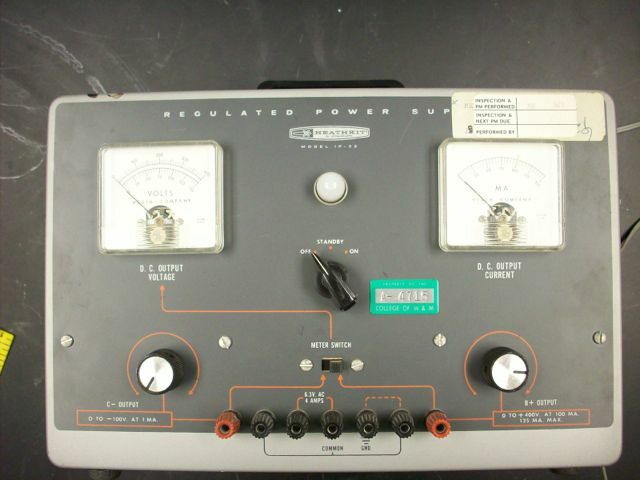 Description: Touch charged objec to the appropriate top piece (rightmost equipment has a shield which must be removed first) and aindicator inside will move. 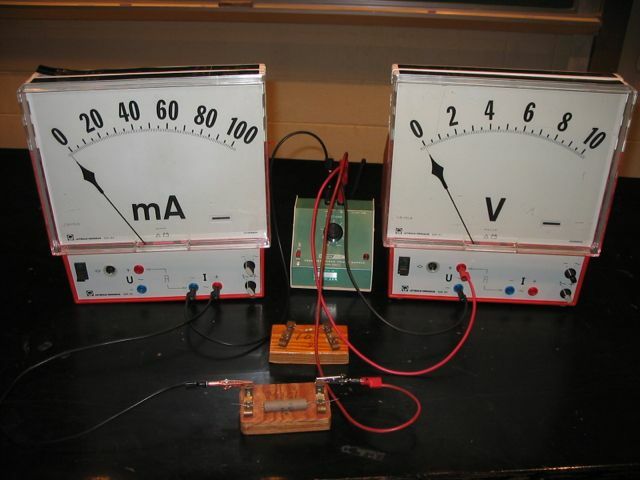 Description: Galvanometer measures current produced by the induced voltage when a magnet is moved into and out of a coil of wire. Description: User configures circuit by changing the arranegment of the metal strips. Description: Assorted cables hang from the demo room wall, various connectors are in the E&M section. 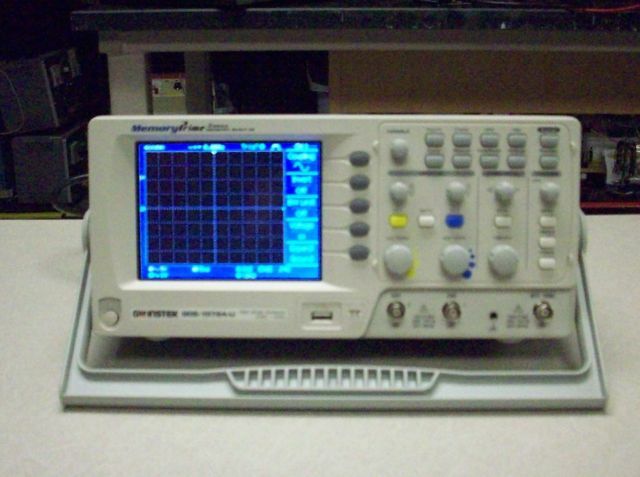 Description: Touch charged objec to the black circle and the needle will indicate. Danger: The large Nd magnets are very strong, and can crush things between them (e.g. fingers). Description: Coils with various connectors (bananna, BNC). 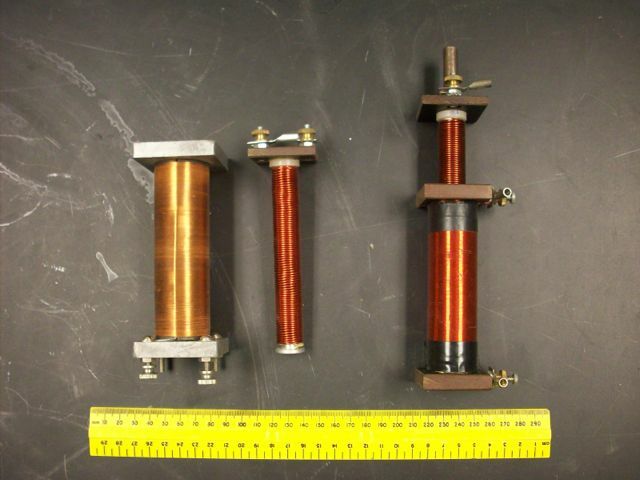 Solenoid with iron core. 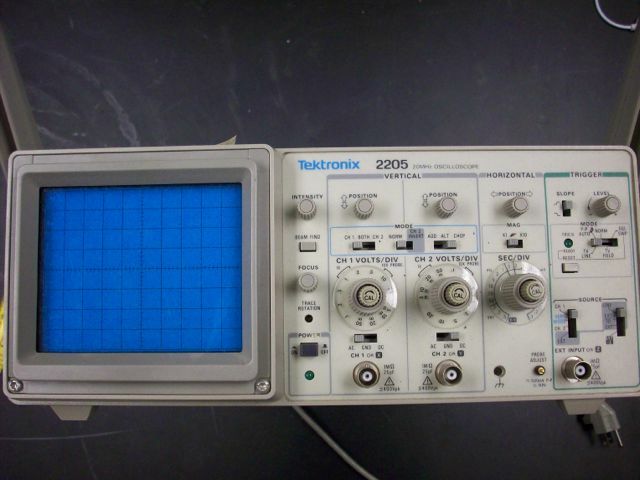 Description: Small breadboard also available. 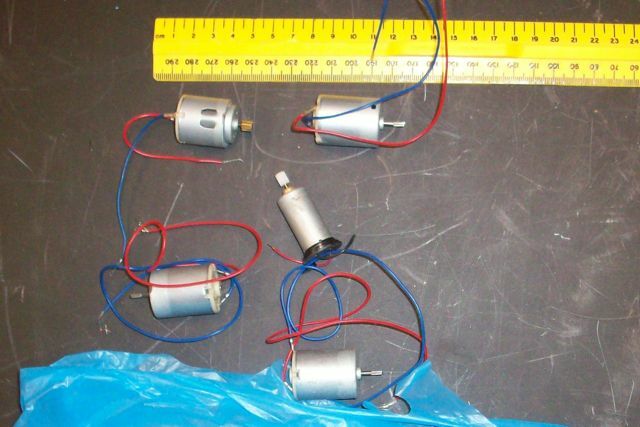 Description: Small DC motors previously powered by AA batteries. Description: Coils, each with screw-down or bananna connectors fit into one another to alter the current and voltage of the circuit. 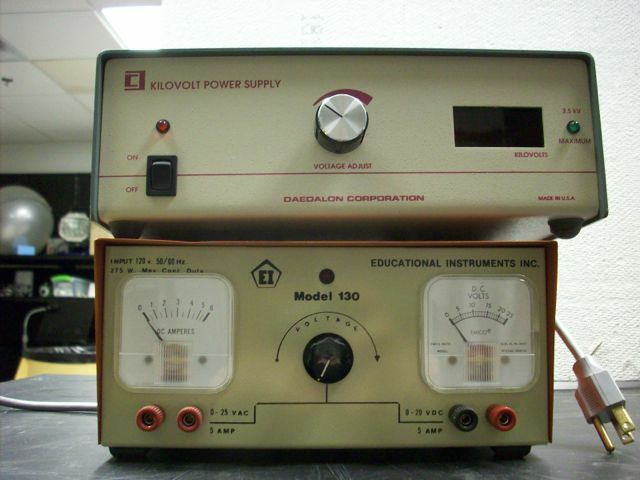 Description: Various current, voltage, and resistance meters. Description: Screw-down terminals. Slide the top to adjust the resistance .